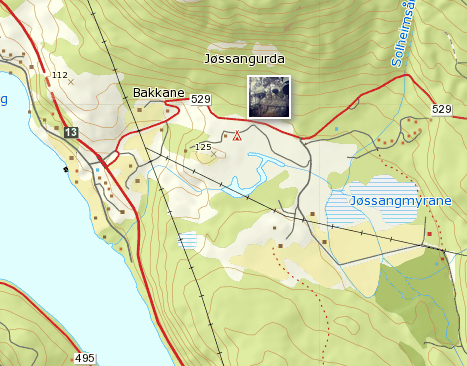 In my previous blog posts, I've worked on the various parts of an expedition map that I plan to use on a 4-weeks hike between Oslo in Bergen. Now I'm ready for a test run. 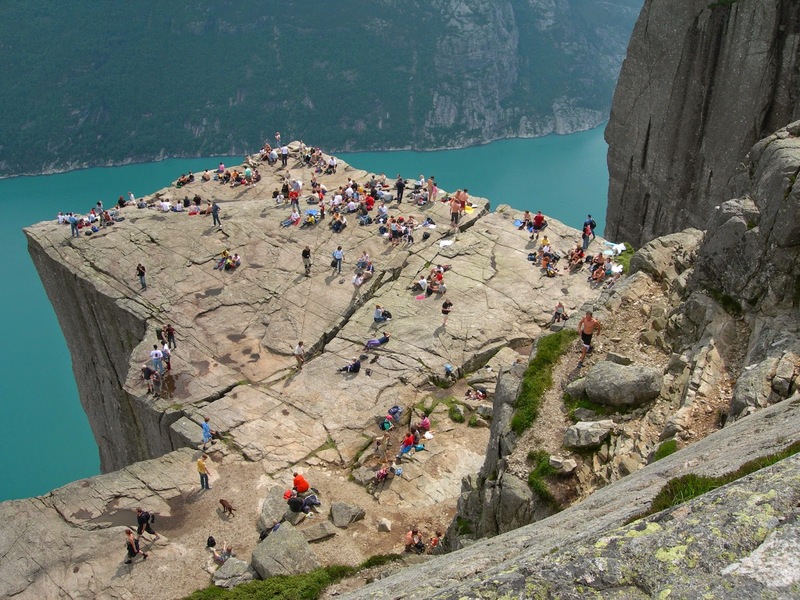 Tomorrow Friday, I'm leaving the island for a hike up to Preikestolen. From one of my previous trips to Preikestolen. Showing real-time positions from my SPOT Satellite Messenger. 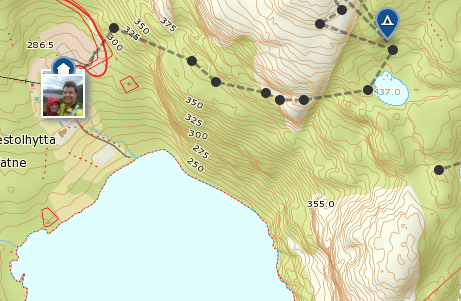 Show the altitude and placename for each position, using an external API. Showing the weather at each position, fetched from api.yr.no. Showing Instagram photos and videos as we walk. If you have nothing smart to do, and if everything works, you can follow us on this map from around 11 AM tomorrow (Central European Summer Time), Friday June 13th. 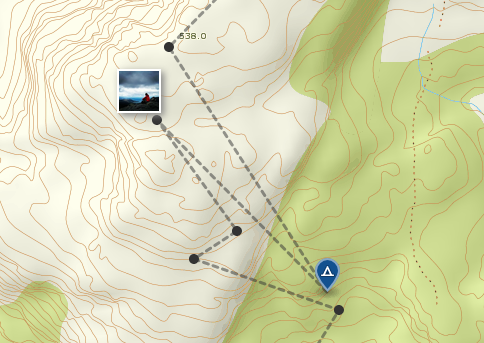 New positions should appear on the map as we walk (every 5 minutes), but you need to refresh the page to get new Instagram photos. I was not too impressed with the performance of my SPOT Satellite Messenger on this trip. but the time, and thereby the dotted line, is wrong. and the time recorded is when it's received and not when the button is pushed. Note to self: Don't use the buttons while walking. Luckily, I didn't fall off the cliff as the map indicates, so that position is clearly wrong. Note to self: Turn off tracking while stopping at a location, especially when making "strange moves". and I got no positions before we reached the end (by the photos). It's a bit strange because it had no difficulties in tracking the start of the trip - in a similar terrain. Note to self: Make sure the SPOT is in a visible positions on the top of my backpack. 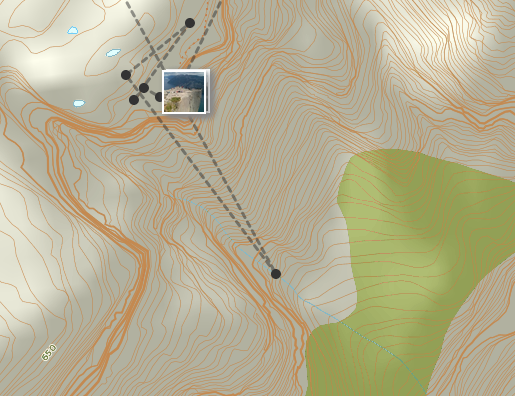 The density of the tracking points will vary in dense woods and/or steep terrain. Most were, but not all Instagram photos were correctly positioned. The photo above should be by the tent marker, but is a few km further west. As the SPOT was also struggling here, I guess it's due to poor mobile coverage. Positions were not appearing on my browser, I had to reload the page from time to time. Also, interestingly, the path you were following doesn't appear in your map? I have been following your blog for ages and have learnt a lot or helped point me in the right direction. The live map is very similar to something I have been playing with for a while, my implementation uses OpenLayers 2 (moving it to v3), rather than leaflet and the locations are sent to a PostGIS database from my Android phone using a script I wrote in Tasker. Hopefully I will be buying a an InReach or a SPOT soon. I have used Social Hiking (http://www.shareyouradventure.com/) in the past and have contributed several ideas to it (peak bagging for instance). These days I maintain my own personal walking log and also log my car journeys. Your live map is far cleaner than Social Hiking or my own and look forward to seeing what you have planned for the future both in terms of live tracking and more widely mapping posts. Hope you have a good trip. I had to refresh my browser periodically to get latest photos. The accuracy of the Spot GPS appears to be poor. The position reports often did not appear to be near the mapped trail. It would be interesting to compare the Spot positions to a track recorded with a Garmin GPS. Marcos: New points will only appear every 5-10 minutes. I'll do some more tests to see if it really happens. All of the paths we followed we're not marked on the map. Steven: Thanks for your feedback! Using a phone sounds like a good option if you have enough coverage and electricity supply where you're trekking. I don't, so I need to rely on satellites and units with long battery life. Haven't heard about Social Hiking - I'll give it a try! I like custom solutions based on open components as it allows me to adapt the site to my needs. Bernie: Thanks for your comment. I'll add support for real-time photos to the Leaflet.Instagram plugin. As noted above, we did not always follow a marked trail. On our second trip, I followed your suggestion and brought a Garmin GPS (track marked in blue). It shows that the positions from the SPOT is quite accurate, but it has some trouble in dense woods.